Welcome to another Tuesday celebrating bookish events, from Tuesday/First Chapter/Intros, hosted by Bibliophile by the Sea Every Tuesday, Diane at Bibliophile by the Sea posts the opening paragraph (sometime two) of a book she decided to read based on the opening. Feel free to grab the banner and play along. 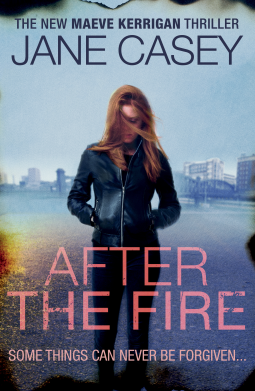 My current read is After The Fire by Jane Casey, the sixth in the Maeve Kerrigan series which will be published on 18 June 2015. There were 224 residents of Murchison House on the Maudling Estate in north London, and on a cold grey late November not one of them was expecting to die. Some were waiting to die But no one actually expected to die that day. Murchison House stood eleven storeys high, an uncompromising slab of cement social housing that dated from the seventies and looked it. Five other tower blocks of varying sizes stood around Murchison House like siblings in an unhappy family. Do you want to know more? Have you read any of the previous books in this series? I like the sense of foreboding in the opening paragraph. This sounds like a mystery I’d enjoy. The first paragraph drew me in. I’m curious to see what’s going to happen. I like it when a book grabs me from the first paragraph like this one did! It’s a decent opener. I would consider reading on if this book landed in my lap. I haven’t read any of this series, but definitely want to know more. Enjoy! I haven’t read this author, but I like the sound of this mystery! There is a sense of dread in that intro, Not familiar with the author or series – hope you enjoy it. Oh, I like Casey’s work very much, Cleo. And I really like the way this paragraph sets up what’s going to happen. I’m very keen to read your review when you’ve finished this one. Jane Casey certainly knows how to grab your attention from the very start – it is a great read, I’ve missed Kerrigan and Derwent! Oh yes! It is one of those series where it helps to know what happened previously – I’m sure you’ll enjoy it when it arrives next week! Sounds good, but I’m trying to read lighter stuff these days. Sounds like a great series, so I’ve just added the first book to my wish list. Yay – I like it when someone is interested enough to add a book to the list – I hope you enjoy it if and when you get to it. I always like finding out about a new mystery series. I’d keep reading! I don’t know this series, but the summary and beginning sound really good. Thanks for sharing! Thank you Lauren – I highly recommend this series. I love books set in London. This sounds like something I would like–a good mystery. I love a good mystery, and this one grabs me! Thanks for sharing…and for visiting my blog. Thanks for coming back – I thoroughly recommend this series. I read the first Jane Casey in the series and enjoyed it greatly. I really need to keep continuing with it! It is worth continuing, if anything this series just keeps getting better. I’m not sure this one’s for me, but I hope you enjoy it! Lovely description of the scene! Interesting opening! Hope you enjoy! Loving it – thank you! I have not read this series, but I am intrigued. It is a great series one I consistently recommend.